I recently started taking a Tang Soo Do Karate class with my girls ages 8 and 11. 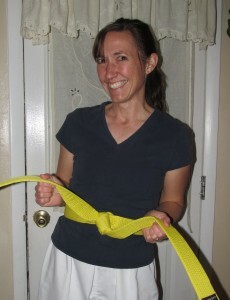 Just last week we each earned the first rank–the fabulous yellow belt! (Yellow just happens to be one daughter’s favorite color so she’s particularly thrilled.) There were many things to learn along the way like vocabulary, and specific types of kicks, blocks, and punches. But what have I really learned from my short 3 months in karate? Here’s a rundown of the top 10 things. 10. I’m older than I used to be. In my brain I can do anything, but I usually go home from class with some new part of me hurting. Good thing it’s temporary and we only have class every other day so I can recover! 9. I’m not very good at motivating myself to exercise. Okay, I already knew that, taking karate just re-emphasized the fact. I’m much better at exercising when someone like a physical therapist or karate instructor is making me do it. 8. My whole body is stronger than your arm. Even if you’re a lot bigger than me (which most people are). 7. I can break stuff with my fist. Our instructor even said I needed a bigger board next time–that was too easy. 6. A punch should land hitting your first two knuckles. 5. Elbows are really good weapons when someone is close. 4. Respect is expected. But just because my girls call our instructor “Sir” doesn’t mean they’re going to call their dad that. 3. Kicking things is fun. Who knew? 2. If someone’s coming at you, it’s okay if you don’t do the moves exactly right as long as you do something and don’t just freeze up. 1. Certain places on a body are more sensitive than others. The solarplex, kneecap, ribs or nose/lip area are better places to aim than a stomach or thigh. Make your hits count for more by aiming for the right places. What about you? Have you had any martial arts training? If you’ve ever considered taking a class, I would highly recommend it if you are physically able to. And by physically able I just mean that you’re not going to keel over from a little exercise. I’ve seen adaptations made for folks in wheelchairs, so most people can do this. It’s especially fun if you have someone you can sign up with, like a sibling or child. Martial arts is a great way to quit procrastinating that exercise you know you need and could be a lifesaving skill some day! Congratulations on your promotion. I couldn’t resist commenting after seeing #3. Yes, kicking things is fun!